Step 2 Place the lime and orange juices in a serving bowl. Add the cilantro, jalapeno, onion and mayonnaise and combine. Add the mangoes and the chicken and stir gently. Season with salt and pepper. Step 3To serve, halve the bread lengthwise and remove some of the soft center. Toast beneath the broiler until lightly browned, 1 minute. Line the bread with the lettuce leaves, then top with the chicken salad. Place the top half of bread on the bottom, cut the bread into six sandwiches and serve. In Recipes-list.com we have selected the most viewed recipes from category - Sandwiches . Enjoy the best recipes specially selected for you! 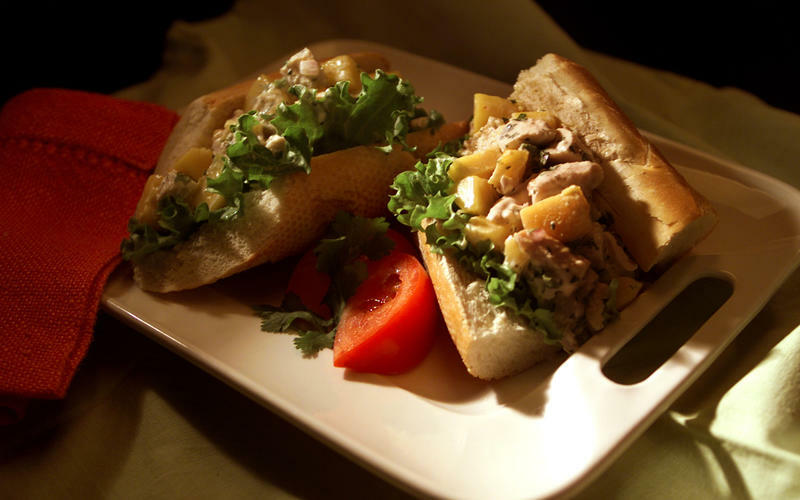 Chicken and Citrus Salad Sandwiches is the right choice that will satisfy all your claims.